Round, arched and curvaceous cutting lines are the special field of the jigsaws. Tight radii and cutouts from a surface are also no problems for the manoeuvrable power tools. 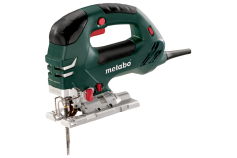 Metabo jigsaws have a variable stroke rate for material-matched sawing into wood, plastic, aluminium or thin sheets. The selectable pendulum stroke ensures optimal chip ejection and fast sawing progress especially when sawing wood. A chip blowing function permits clear view of the cutting line for precise sawing after initial cut. 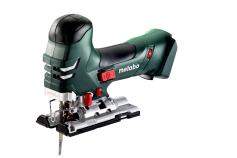 All Metabo jigsaws can be rotated by 45 degrees in both directions for bevel cuts. 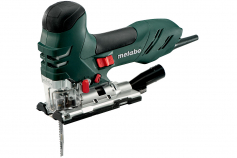 If the saw blade needs to be changed, this can be done quickly and without complications thanks to the tool-free quick change system "Metabo Quick". 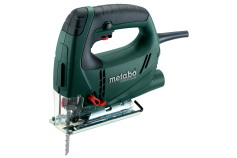 Metabo jigsaws are available with bow type handle and also with a handle area at the slim motor housing. The user can choose which shape he prefers. In both designs the handle area is equipped with a soft-grip surface for comfortable and safe guiding of the jigsaw in any application. A total of four jigsaws have a rated input power of 750 Watt and manage impressive cuts in wood up to a material thickness of 140 mm. In NF metals the maximum cutting depth is 35 mm and in sheet steel 10 mm. The powerful cutting performance of this powerful jigsaws is also possible thanks to the VTC electronics for constant speeds under load. The top models STE 140 Plus and the STEB 140 Plus with bow-type handle have an additional auto start with stroke acceleration for easy sawing and a motion-activated LED work light for bright illumination of the cutting line. The restart protection prevents unintentional startup after a power cut for the user's safety. 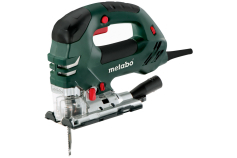 With what are you able to achive top performance with a Metabo jigsaw? 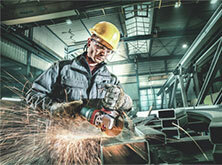 For example with high-quality saw blades from Metabo. The saw blade range covers all important applications areas of a jigsaw: for wood, metal and special applications there are numerous blades in different versions available. Cleverly compiled assortments round off the saw blade range. For circular cuts and precise parallel sawing we recommend using a circle-cutting and parallel guide. The Metabo all-purpose vacuum cleaner is very well suited for the effective chip extraction while sawing in closed rooms. 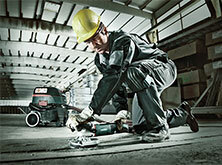 All system components around the Metabo jigsaw are perfectly matched and cooperate in a precise and efficient manner.